Hip, hip, hooray! I just love the idea of a perpetual calendar to keep track of important birthdays from year to year. We’re hard at work on our Summer 2013 release of the next Simplified Planner, Simplified Life Binder and lots of other amazing items. I can’t wait to tell you all about them. Hope you enjoy this free printable for your planner this year! Simply download it, print it out, punch holes and slip it in! 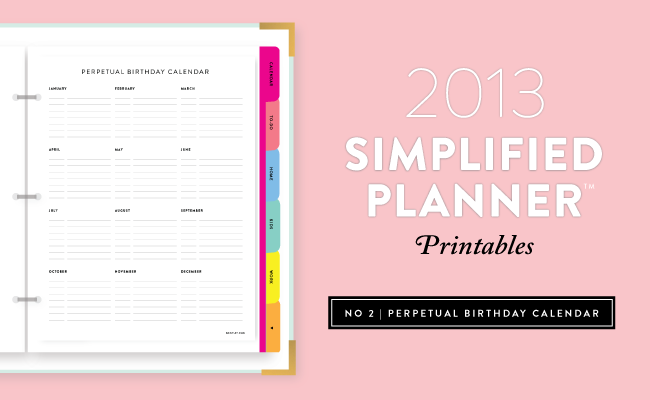 DOWNLOAD YOUR FREE PERPETUAL BIRTHDAY CALENDAR HERE. DOWNLOAD YOUR FREE 2013 YEAR AT A GLANCE CALENDAR HERE.